Through my research writing various wellness stories for Byrdie, I've come across the benefits of tart cherry juice several times over. My first thought was, Why tart? Is there something about the sour flavor that makes it better? Technically, no. A 2018 study examined the merits of tart and sweet cherries, and both were found to have similar positive health attributions. The real difference is that sweet cherries are typically eaten fresh and are only in season in the summertime, whereas tart cherries are often used as a juice concentrate or in cooking and baking and therefore available year-round, presumably accounting for a greater amount of studies done with the tart variation. 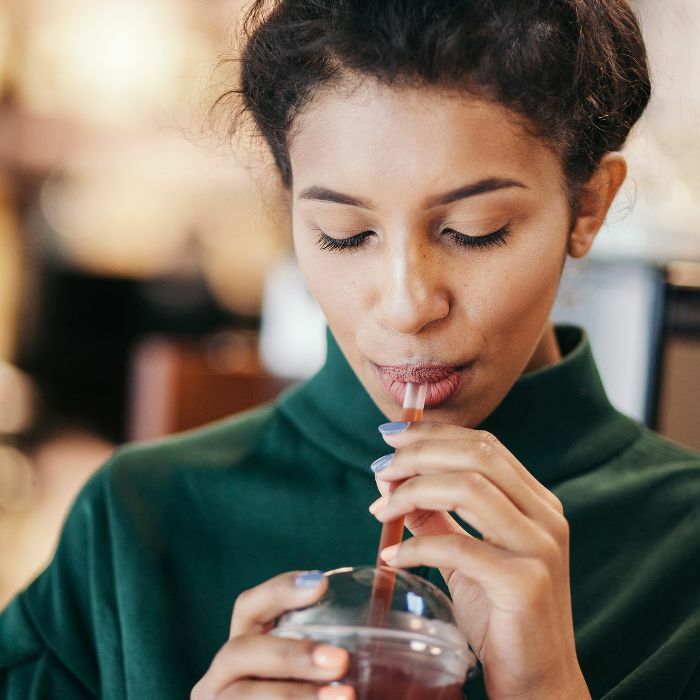 And while it may be a bit too potent to consume on its own (think unsweetened cranberry juice—many people opt to mix it into a smoothie) science, medical health professionals, and nutritionists stand behind throwing back a glass. "Overall, cherry juice can be a positive addition to a healthy diet," says Kaley Todd, RD and Nutritionist for Sun Basket. "However, when choosing cherry juice or eating tart cherries, make sure the product does not contain added sugar, and that the product is 100 percent cherries. Also, be mindful that when adding cherry juice to the diet, you are also adding additional calories." Flavor and calories aside, the science behind tart cherry juice is fascinating—its antioxidative, anti-inflammatory properties have been found to address a number of health concerns in such a profound way that it makes us want to consider buying bottles in bulk. "Researchers believe tart cherries may provide a number of cardiovascular benefits due to their amount of anthocyanins," explains Todd. [Ed. note: anthocyanins are the blue, red, or purple pigment found in plants and are a type of flavonoid, a class of compounds with antioxidant effects.] "Studies indicate that they may help lower levels of cholesterol and triglycerides, reduce inflammation, and improve belly fat—all factors specifically linked to heart disease risk." She adds that a University of Delaware research study found that older adults who drank tart cherry juice experienced a reduction in systolic blood pressure and low-density lipoprotein (LDL), or “bad” cholesterol. Tart cherries are natural sources of melatonin, a sleep-inducing hormone that rises and falls with the level of light surrounding you (it's highest at night and while you're sleeping and decreases sharply in the morning and throughout the day). "Researchers believe it’s the combination of melatonin and the anthocyanins in cherries that might help you sleep better at night," says Todd. "One study found adults who drank two servings of tart cherry juice concentrate each day for seven days slept about 40 minutes longer on average and had up to a six percent increase in sleep efficiency, compared to the participants who drank another beverage." Because of its high anti-inflammatory and antioxidant properties, tart cherries are a great source of recovery for muscles after working out. Says Todd, "Cyclists who drank tart cherry juice concentrate before a three-day simulated race experienced less inflammation and oxidative stress compared to those who drank another beverage, according to a new U.K. study." "[One] study found that participants who drank 10.5-ounce bottles of tart cherry juice twice daily for 21 days experienced a significant reduction in serum biomarkers of inflammation," says Todd. "The researchers concluded that cherry juice may be an effective way for osteoarthritis patients to manage their disease." Separately, another study found that patients who consumed two 8-ounce bottles of tart cherry juice daily for six weeks experienced a significant improvement in pain, stiffness and physical function as it related to their osteoarthritis. Let's say you can't stomach the taste of tart cherry juice, whether you shroud it in a smoothie or not. Luckily, research finds that cherry supplements help with pain management and inflammation as well, so you can skip the puckered lips. Ed. note: Before taking supplements or changing your diet, please speak with a health care professional to ensure introducing tart cherry into your diet is safe for you. Up next: Find out what happened to my skin when I drank spearmint tea for several weeks.